September 2018. MEET PIERRE RAMONET, GREAT WHITE BURGUNDY PRODUCER. In 1980 or thereabouts, when I was still domiciled in Sweden, my writings came to the attention of Connoisseur magazine in New York. Over the next few years – until the magazine was taken over and changed direction – I wrote a series of articles for them, mostly about food and wine but also about such diverse subjects as art, architecture, and Swedish crystal. One of the wine articles focused on Pierre Ramonet, arguably the top producer of white Burgundy and one of the region’s most colourful characters (Balzac would have loved him!). In researching my article I had the privilege of meeting up with him on a number of occasions. The following text is based upon my accounts, written all those years ago, of our various meetings, discussions, and tastings. Complete with the original photographs by Sebastião Salgado. PORTRAIT. Pierre RAMONET of Burgundy, just short of eighty when I met him in the early 1980s, and one of the greatest wine makers in France, had dreamed all his life of owning a parcel of a small plot of land south of Beaune that happens to give the best dry white wine in the world. The grand cru vineyard called Montrachet. Ramonet had long owned parts of the adjoining vineyards Bâtard-Montrachet and Bienvenues-Bâtard-Montrachet, both grand cru vineyards too and able to yield great wines, so it cannot be said that he had ever played second fiddle. But when at Iong last, in his seventy-third year, he obtained a tiny segment of Montrachet in 1978, it was as if a virtuoso violinist had come into possession of a Stradivarius. Many of the world’s choicest wines are grown on the Cote d’Or (“golden slope”) of Burgundy, notably its thirty-one grands crus. Of the six white wines, five are grown in or around the villages of Chassagne-Montrachet and Puligny-Montrachet. In accord with the custom of the region, the villages have added to their own names that of the great vineyard of which each straddles a part. Made purely from the Chardonnay grape, the top whites that Ramonet and his confrères produced are full and scented, dry yet succulent, and can match with authority such comestibles as sole, turbot, lobster, Bresse chicken, and foie gras. Behind their opulent bouquet, which may suggest peaches, apples, cinnamon, apple blossoms, greengages, nuts, and yellow roses, lies a solidly classic structure. Their intensely fruity flavour, balanced by fresh acidity, can linger a long time. Nearly two hundred growers and shippers, many of them highly respected, are based in the two villages, but “Père” Ramonet was almost legendary – one of the greatest and best-known vignerons in France, supplier of white Burgundy to presidents , kings, and top restaurants. Born in Chassagne-Montrachet on March 1, 1906, in the same house he lived in when I knew him, Ramonet had more zest for life than most striplings. He still worked day in, day out, to make wines as perfect as nature would allow, bringing to his métier the perfectionism of a great artist. He always rose before dawn and was out in the vineyard alone until late in the evening, with only a brief pause for lunch. His fourteen hectares of vineyard (another three lay fallow) were planted with some 140,000 vines, which he himself tended. During the few hours a week when he was not in the fields, he was at work in the cellars or the winery, attending to one or another of the vigneron’s countless tasks. The English wine merchant Anthony Goldthorp, of O.W. Loeb, said to me years ago, “Ramonet is a marvelous man and absolutely the greatest producer of white wines in Burgundy. In poor years he’s always the exception, the one who manages to make good wine when the others fail, and his wines are always different. He’s a great character, too, quite unique. He’s totally dedicated, out in the vineyards all the time. The only time you get to see him is when it’s raining”. Unlike most top Burgundy wine makers, Ramonet was not born into a family of vignerons. His farmer father came to Chassagne in the late 1890s from the plains of Saône et Loire, settled down in the village, married a local girl, and began buying plots of vineyard yielding ordinary wines. Pierre Ramonet began working in the vines when he was a small boy and bought his first parcel of vineyard – a segment of the premier cru Grandes Ruchottes – in 1938. Since then, slowly but surely, he had built up his domaine to its then present size. He had no permanent employees, and the only assistance he received, save at harvest time, was from his son, André, and a grandson, Noel, who was a trainee oenologist [it is Jean-Claude RAMONET who is now in charge in 2018]. It was almost impossible to contemplate the size of Ramonet’s self-appointed task. Every one of his 140,000-odd vines needed careful tending, which included the delicate task of grafting every new young vine onto phylloxera-resistant roots. In addition, there was manuring, replacing eroded soil, weeding, and fighting insects, rot, and virus infections – among them the dreaded court noué, which withers and often kills the entire vine. Moreover, every vine had to be pruned, a crucial task that Ramonet would never entrust to others. In their classic work The Wines of Burgundy, Pierre Poupon and Pierre Forgeot write, “Left entirely to nature the vine becomes tangled up with useless branches which quickly exhaust it and hinder regular fruiting. One must, therefore, domesticate the vine like an animal.” They add, “Only the vine grower who halts several times a year and over a number of years in front of each of his vines can, if he loves his craft, acquire sufficient experience to enable him to guide the vine to perfection.” Ramonet was just such a vine grower. But even that is not all. There was the harvest itself, which involved picking hundreds of thousands of bunches of grapes, and then the crucial fermentation. One false step could have resulted in spoiled wine. Pierre Ramonet owned parcels of several premier cru wines – Grandes Ruchottes, Caillerets, Clos de la Boudriotte (red only), Morgeot (red and white), and Clos St. Jean – as well as several hectares of ordinary reds and whites that were entitled to be named only after the village (e.g. “plain” Chassagne-Montrachet). Of grand cru vineyards he owned 0.8 hectares (nearly two acres) each of Bâtard-Montrachet and Bienvenues-Bâtard-Montrachet and a mere twenty-five ares (0.25 hectare and less than an acre) of Montrachet itself. This is the wine that, in the British expert Hugh Johnson’s words, earns its fame by “an almost unbelievable concentration of the qualities of white burgundy. It has more scent, a brighter gold, a longer flavour, more succulence, and yet more definition.” Alexandre Dumas made the celebrated comment that it should be drunk kneeling, with head bared. Montrachet is surely one of the most euphoniously named of wines, though the origin of the name is not very poetic. According to André Simon, “Rachet, in Burgundian parlance, means bald, and Mont-Rachet, which was the original spelling, still to be seen on old labels, meant the hill without a tree”. The vineyard covers just 7.48 hectares, and the average yearly yield is in the region of just over 30,000 bottles, 1,200 to 1,500 of these bottles coming from Ramonet’s part of it. Almost all of the Montrachet used to belong to the Marquis of Laguiche, who, with two hectares today, remains the biggest single proprietor. Others include Domaine de la Romanée-Conti, Bouchard Père et Fils, Comtes Lafon, Baron Thenard, Domaine Leflaive, and the Duc de Magenta. Ramonet was so great a wine maker that he often made a Bâtard Montrachet equal to other producers’ Montrachet. But because Montrachet is without question the greatest vineyard, Ramonet had early on decided that he must secure a part of it. It is fitting that 1978, his first Montrachet vintage, should be one of the best in living memory for white Burgundy. It also says something about Ramonet that, though then in his seventies, he strove body and soul to make a wine that he could not live to enjoy at its best, a wine using the full potential of the vintage that would endure for thirty years or more. Pierre Ramonet’s holdings in premier cru and grand cru vineyards were beyond price, but money meant little to him save as a means of making better and better wines (nonetheless, he had the peasant’s respect for the power of money; according to legend he shook the village notaire by paying for his Montrachet plot with barrowloads of ancient banknotes!). He looked and dressed like a peasant, wearing an ancient cap of unknown vintage, a rumpled checked shirt, and thick blue-denim trousers held up by braces. But this peasant-vigneron was welcomed with open arms in all the greatest restaurants in France, and his wines were drunk with gratitude and humility by connoisseurs the world over. They were sold out long before they were bottled. His face was deeply lined, but his blue eyes sparkled with life, glittering and shining with curiosity, enthusiasm, and excitement. He talked at a tremendous pace. The subject would veer from the weather to wine, and from the wines of Chassagne to those of Corton, Chambertin, Musigny, and Richebourg. He seemed to know about everything that was happening throughout the “golden slope” and could always tell you which producers were good, which had compromised their standards, which were no good at all. He knew that so-and-so in a certain village in the Côte de Nuits has made an advantageous marriage that would allow him to buy more vineyards, that another farther south had turned into a commercial shipper, and that another, in Santenay, tended his vines and wines with particular skill. Like all truly creative people, Ramonet was full of praise for colleagues who had worked hard and well to achieve excellence. “Tollot-Beaut in Chorey are very good, très sérieux. When I drink their wine, I always choose a Beaune Clos du Roi, because the vines are very old. Romanée Conti are among the best – have you ever tasted their Montrachet? – and Hudelot-Noëllat, in Chambolle-Musigny, make good wines; also Roumier. But not X – that is not a good house. My favorite red from the Côte de Nuits is Musigny from Comte Georges de Vogüé’s estate…” and he went on to single out a dozen other fine producers throughout the region. Again he left the room, to return with a 1976 Bâtard-Montrachet. It has a splendid green-gold colour, with glycerine-thick tears. The scent was strong, the flavour rich and weighty. It persisted in the mouth, the main theme soon developing subsidiary flavours – a great, opulent wine, then still several years from its peak. Pierre Ramonet’s tasting room was small and bare. The walls were painted a sulphurous yellow; the floor was covered with mottled tiles; light was supplied by fluorescent strips in the ceiling. On the refrigerator stood a large blue jug bearing a coat of arms and the name Ramonet. The table was covered with a plastic cloth. The time arrived to descend to the cellars to see how the young wines were developing in casks. 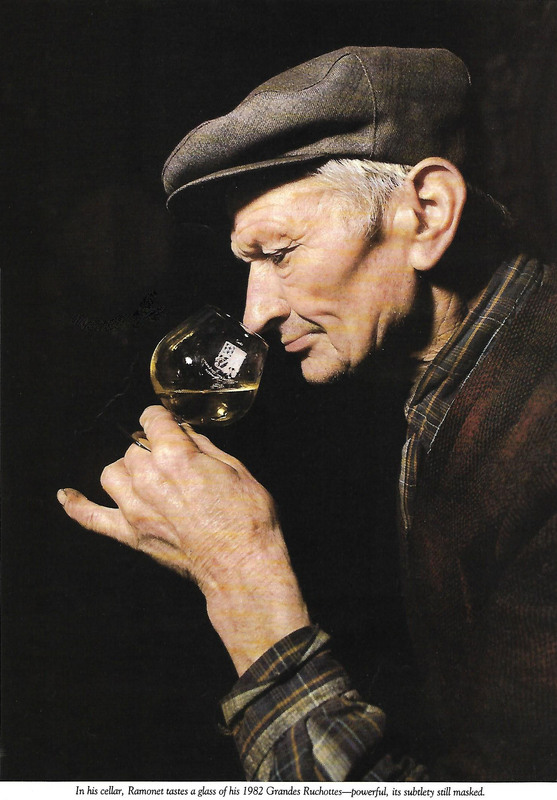 “I do not use one hundred percent new oak casks for the new wine,“ Ramonet says. “I feel they give it too much tannin, and a woody flavour too. Between one-third and one-half is about optimum, with the rest made up of casks from a previous vintage or two.” He got up to draw off a glass of the first wine, using a glass pipette. A 1982 Grandes Ruchottes had a bright, light-gold colour and a ripe, grapey scent with hints of honey. The flavour was full and assertive, but most of the wine’s subtlety was still masked by the raw young acids and tannic astringency. A 1981 Bâtard-Montrachet was still more powerful, with lots of body and persistence. An extra year of maturing revealed much more of its complex structure. But the 1981 Montrachet that followed confirmed everything that Ramonet had said about the wine’s overall supremacy: a luminescent green-gold colour that seemed almost to glow in the semidarkness, like radium; a big perfume with the immense, opulent scent of the Chardonnay; and an almost intimidatingly strong flavour: one feels one is tasting the essences of precious minerals. Seeming to open up all manner of sensory possibilities, it was a strong, many-faceted wine sure to outlive the splendid Bâtard by a good decade. It was a wine that I would have liked l to taste again in ten years – with Ramonet, I hoped. 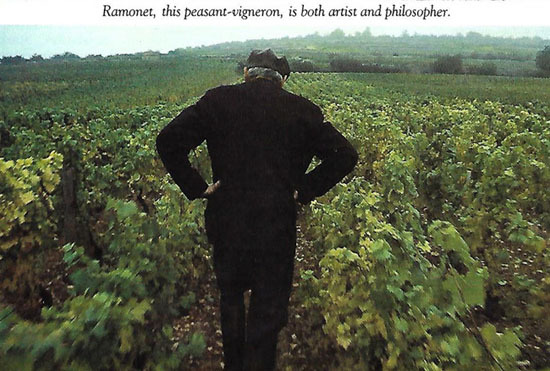 Pierre Ramonet, vigneron extraordinaire, died in 1994, aged 88. Photographs with the courtesy of Sebastião Salgado (Amazonas Images).